The gold Maple is a Canadian coin, designed by the same designer as the Krugerrand. 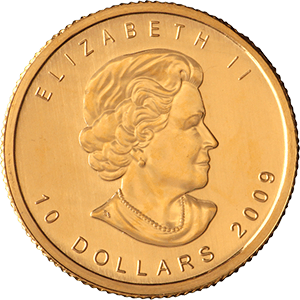 The gold Maple features the iconic maple leaf on the reverse and Queen Elizabeth 11 on the obverse. The 1/4 oz Gold Maple Leaf coin was one of the first gold bullion coins minted to compete with the South African Krugerrand. After a limited amount of 1oz Gold Maple Leaf coins were released in 1979, the Royal Canadian Mint expanded production in 1982 to include the 1/4 oz and 1/10 oz. So successful has the Maple Leaf been that over the next few decades another three standard weights, and various special editions, have been produced. The 1/4 oz Maple Leaf is one of the very purest gold bullion coins in the world. With the exception of the original mintage of the 1oz coin (from 1979 to 1982, when the coin was just 22 carats) all Maple Leaf coins are 24 carats, meaning they are 99.9% pure gold. This can make them easily marked, however, so it is essential that they are handled and stored with great care as even the smallest scratch can affect its value. The coin’s design is among the most aesthetically pleasing of all gold bullion. With much of the coin showing a left clear, it is minimalistic yet intricate. The coin’s inverse is the iconic Maple Leaf that the coin is named after, while the portrait of Queen Elizabeth II on the coin’s obverse is framed by her title above and the coin’s value beneath. It’s design has remained the same since its introduction in 1979 and shares the same engraver as gold bullion’s most famous coin, the South African Krugerrand. 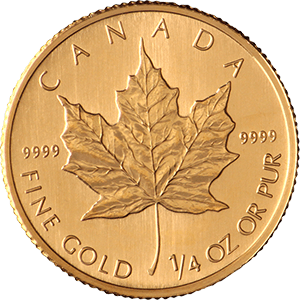 The 1/4 oz Gold Maple Leaf has a diameter of 20mm and thickness of 1.70mm. With a face value of $10, it’s pure gold content alone makes it far more valuable. As with all gold bullion coins, however, this will depend on how its condition.